Step-up transformers are sold according to their kilowatt-volt-amp (KVA) rating, often referred to as the transformer's "size." 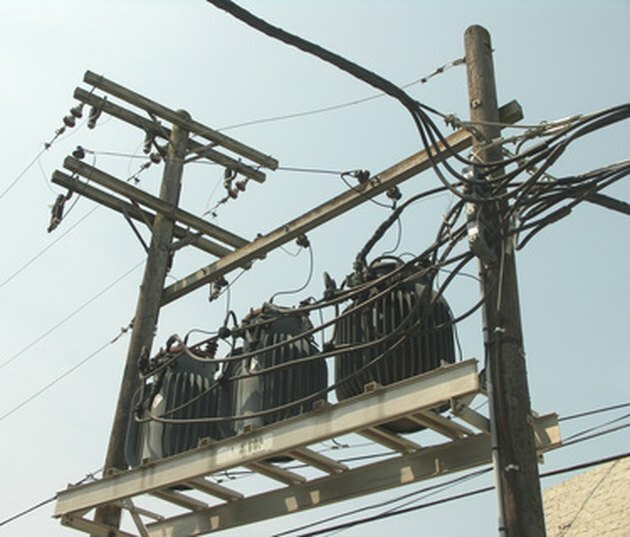 When determining the proper size step-up transformer needed, there are two applicable rules: electrical codes and Watt's Law. All transformers carry a KVA rating that identifies the transformer's electrical characteristics. Under the National Electrical Code, a step-up transformer must have certain current carrying protections in place. There must be a main circuit breaker installed in a load center served by the transformer, and the main breaker can be no larger than 70 percent of the maximum current capacity of the transformer. All transformers have a KVA rating. This rating represents the transformer's maximum capacity in kilowatts (thousands of watts). In calculating what KVA means in practical terms, Watt's Law is applied. In Watt's Law, power (P) equals the output voltage (E) times the ampere capacity (I). Using this formula, P = E x I, and its direct derivatives, I = P / E and E = P / I, all transformer attributes can be calculated. For example, if the transformer's rating is 10 KVA and has a 240-volt output, it has a current capacity of 41.67 amperes (10,000 watts / 240 volts = 41.67 amps). Watt's Law also applies when choosing a step-up transformer for an application. If a transformer needs to step-up 240 volts to 480 volts, and you need a maximum current capacity of 40 amps, you must first calculate the number of amps needed to comply with electrical codes. If the codes require a maximum usage of 70 percent of the transformer's capacity, multiply 40 times 1.43. The product will be 57.2 amps, 70 percent of which is 40.0 amps. Knowing you need 57.2 amps (I) and the output of 480 volts (E) Watt's law can be applied as P = I x E. Therefore, 57.2 x 480 = 27,456 watts, or 27.456 KVA. This would be the minimum size transformer required for this application. Living in Ohio, Gerry Poulos began writing professionally in 1999. He has been a columnist for the Nation News Bureau, a contributing editor for “Protoculture Addicts Magazine,” an accomplished freelance journalist and photographer, a Web author and is the author of several books. Poulos attended Syracuse University and holds a Bachelor of Science in electrical and mechanical engineering. What Gauge of Wire is Used to Wire a 220-Volt Hot Water Heater?